BBC crew travels to quake epicentre Jump to media player The epicentre of the earthquake which devastated Nepal, in the district of Gorkha, has suffered "terrible destruction". The small village of Lukla at the base of Mount Everest has become the centre for the rescue effort, following avalanches after the massive Nepal earthquake. 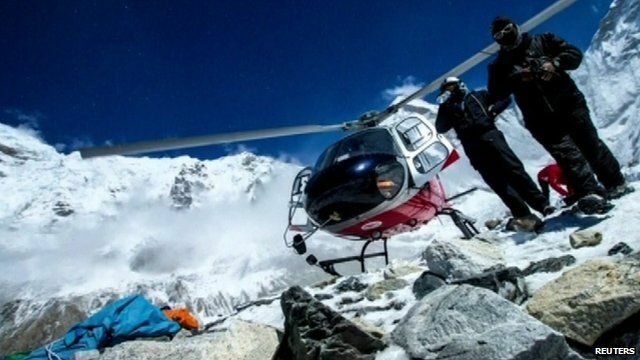 A constant stream of helicopters has been flying survivors from Everest and the surrounding area, along with the dead. The earthquake in Nepal triggered a huge avalanche on the mountain that killed at least 17 climbers and guides. It is the worst single disaster on the world's highest peak. Jonathan Head reports from Lukla.